STEEL SOUL is a Home Grown hard-rock band whose musical influences come from such rock legends as Deep Purple, Whitesnake, Jeff Beck, Rush & Led Zep......!!! The band comes from Fort Lauderdale Florida, and was created by Tone D Farkas (guitars), Brian Fitzgerald (percussion, keyboards) and The fantastic (Your Name Here) (bass)Our newest member. STEEL SOUL started touring the local clubs with repeats of classics of Rock’n’Roll. Concerts were starting to attract more people and the first fans made their appearance. In 2008, for their first participation at Tobacco Road, the famous club in Miami Beach, Florida. STEEL SOUL opening act with a superb show in front of a crowd of about 165. The band began to feel more confident on stage and the writing and compositions move to a higher level. The work led to the recording of the second album “Escape From Dominance” in 2012 which contains 10 tracks. This quality production is due to the talent of drummer Brian Fitzgerald, and the guitar player Tone D. Farkas. This album sounds much more professional than the first one. 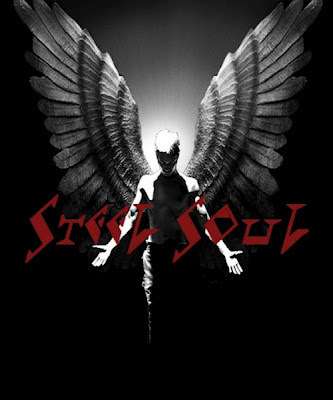 “Escape From Dominance” will allowed STEEL SOUL the distribution of the two albums. During the first part of 2012, STEEL SOUL have experienced many new opportunities and have increased their fan base to the tune of over 10,000. Today, the band always hopes finding a biggest deal with a major and is preparing the recording of a third album in 2010 (surely the best one!!) and a new series of gigs across the USA with their new bassist (Your Name Here), who has been a major influence in the new songs written by the new STEEL SOUL. So prepare yourself to a big dose of rock n’ roll, and amazing live performance guaranteed!! If You Like The Music Of Steel Soul, Please Buy It ! !